Simplify your packing slip insertion process by automating it with FOX IV’s Automated Documentation System. 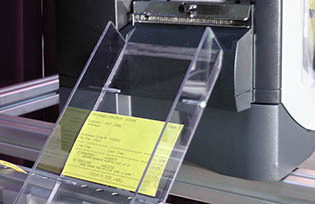 This integrated, turnkey system interfaces with your order database through a scanned “license plate” bar code, prints and inserts the appropriate packing slip into the open top carton or tote, print and applies the matching shipping label, verifies that label, and releases the shipping container to the shipping lanes. 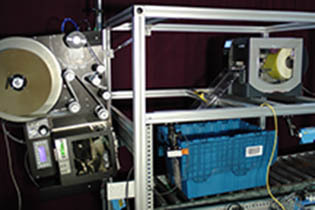 The Automated Documentation System includes everything you’ll need to automate your packing slip insertion/shipping label process including: Conveyor,Scanners, Software Interface, Computer (if needed), variable length packing slip insertion printer with cutter, label printer applicator and label verifier. FOX IV’s expert software engineers can integrate the ADS with your WCS system or set up a stand-alone station. The Automated Documentation System can be used for boxes or reusable totes.